Kauai is a land of adventure and scenic beauty from the steep seacliffs of the world-renowned Na Pali Coast to pristine beaches, botanical gardens and great hikes. More than just a vacation destination, Kauai is a place to create memories that will last a lifetime. Kauai activities offer something for everyone from oceanside golf to sunset sails and whale watching. Zipline through the treetops or ride an ATV in a mountain valley. Enjoy a guided ocean kayak adventure, or explore the undersea world on a snorkeling cruise or at one of Kauai's many great snorkeling beaches. A popular north shore attraction is Kilauea Point National Wildlife Refuge where you can see many species of Hawaiian seabirds as well as the historic Kilauea Lighthouse perched atop a peninsula bluff. This is the northernmost spot in all of the main Hawaiian Islands and provides panoramic views. Visit the red-hued Waimea Canyon to see what Mark Twain called the "Grand Canyon of the Pacific" which is thousands of feet deep and more than 10-miles long. More than 40-miles of hiking trails explore the canyon as well as nearby Kokee State Park. With a permit and some planning you can hike the rigorous and rewarding Kalalau Trail along the Na Pali Coast where steep seacliffs rise up thousands of feet to majestic peaks. No permit is required for a day hike along the first two miles of the Na Pali from Kee Beach to Hanakapiai Beach, and from there you can hike up the valley to an impressive waterfall. Gentler outings include a riverboat trip up the Wailua River on the east side to see the Fern Grotto. Don't miss the nearby Opaekaa Falls as well as the iconic 80-foot Wailua Falls which was shown in the opening credits of the long-running television show "Fantasy Island." Plant lovers can visit the Limahuli, McBryde and Allerton Gardens to learn about Hawaii's native species as well as plants introduced by the first Hawaiians. Na Aina Kai Botanical Garden on the north shore is known for its delightful topiary and sculptures. Considerably less populated than Oahu, Kauai has a unique harmony between its remote places and places with things to do and see. Millions of years of rain and wind have carved the remote and wild formations with undeniable grandeur at every level from sandy beach to high mountain peaks. Much of Kauai is not accessible by road or even trail so the only way to see these areas is on a helicopter tour. In less than an hour you can fly all around the island from Wailua Falls to Waimea Canyon, along the Na Pali and over the north shore beaches. You can even peer into the summit crater of Mt. Waialeale, known as the "wettest spot on Earth." Kauai also has many festive annual events including the Waimea Town Celebration (Feb.), Kauai Hula Exhibition (June), Koloa Plantation Days (July), Polynesian Festival (Aug.) and the Kauai Taro Festival (Oct.) in Hanalei. More than 40 beaches on Kauai offer something for every type of traveler from families with small children to couples seeking a romantic getaway. Some of Kauai's beaches are easily accessible while others are worthy for the travel it takes to get to them and the scenic gifts that await upon arrival. Notable beaches on Kauai include Hanalei Bay and Kee Beach on the north shore, Poipu Beach on the south shore and Polihale at the end of the road on the west side just to name a few. Secret Beach on the north shore requires a short hike to reach and is a great place to spot spinner dolphins leaping from the sea with acrobatic flips and spins. 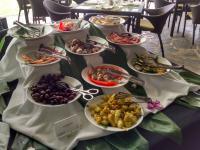 Kauai has numerous upscale resort restaurants at the major resort areas in-cluding Princeville and Poipu. There are also many independently-owned eateries that serve a wide range of popular cuisines. In the larger towns of Lihue and Kapaa on the east side you will find dozens of restaurants from fast food to fine dining. Smaller Kauai towns also offer culinary gems such as Bar Acuda in Hanalei on the north shore, and two award-winning restaurants in Kukuiula on the south shore: Merriman's Kauai and Josselin Tapas Bar & Grill. Those interested in fresh foods and items to cook in their vacation rental or eat immediately will find Sunshine Markets (Farmers Markets) in different parts of the island Monday through Saturday. Shopping on Kauai is equally indulgent and fun with open-air markets and shopping centers filled with unique jewelry, local crafts and Island apparel. You will find upscale boutique shopping in the resort areas including Princeville Resort on the north shore as well as Poipu and Kukuiula on the south shore. Hanapepe town on the west side features "Art Night" every Friday evening with more than fifteen galleries and shops staying open late. Vendors set up booths and you can meet the artists and shopkeepers while being entertained by live music. Look for the "Kauai Made" label when perusing the shops throughout the island to take home an authentic souvenir. Renting a car is recommended when visiting Kauai so you can explore the is-land's best sights and attractions from Waimea Canyon on the west side to to the north shore beaches. Kauai is a relatively small island and a drive from the north shore to the south shore takes about one hour. 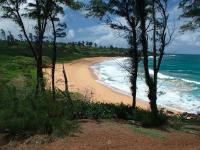 "Sunny Poipu" on the south shore of Kauai is known for its idyllic weather all year around. The north shore receives more rain overall, which is why the landscapes are so lush and green. The east side is the windward side of the island enjoying the cooling tradewinds while the west side is the hottest and driest area which makes for great sunny beach days. Ocean conditions vary each day though typically the north shore will have the calmest waters during the summer and the south shore will have the calmest waters during the winter months. For swimming and ocean activities visit Kauai's lifeguarded beaches and ask about the conditions on that day. Hawaiian Beach Rentals offers many great places to stay on the "Garden Isle" including vacation rentals, Kauai condos and luxury rentals. Kauai vacation rentals provide a wonderful way to enjoy your vacation with all the luxuries of resort living yet all the comforts of home. From Kauai beachfront homes and villas to condos, homes and other accommodations, we offer top-quality accommodations in all of the most sought after destinations. Stay in a Princeville vacation rental to enjoy the amenities of scenic Princeville Resort on the bluffs above beautiful Hanalei Bay with the stunning backdrop of the north shore mountains. Also along Kauai's majestic north shore are Hanalei Bay rentals and Haena vacation homes at the beginning of the famed Na Pali Coast. The prestigious Anini Beach region offers crystal blue waters protected by an offshore coral reef. 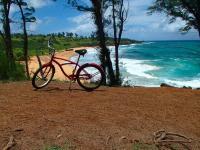 On Kauai's sunny south side enjoy Poipu vacation rentals near immaculate white sand beaches. 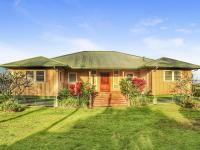 On the west side stay in Kekaha with close proximity to great hiking trails in Waimea Canyon, Kokee State Park and one of Hawaii's longest beaches at Polihale State Park. Browse through our Kauai vacation rental listings to get an understanding of the different amenities and property features we offer. 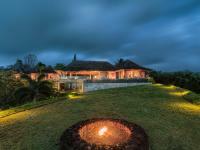 Our goal is to provide you with an unforgettable Kauai vacation home or condo for your dream Hawaii vacation. We take pride in having the largest selection of high-quality vacation rentals in Kauai, and also in the fact that we stand behind our product and make sure only the best of the best Kauai properties are listed on our site. If you have any questions about our Kauai rentals or which area is best for your travels, please give us a call and we will be happy to assist you. Kauai is the oldest of the main Hawaiian Islands, having formed some five mil-lion years ago. Time and the elements have eroded the volcanic landscapes and today Kauai has the most beaches per mile of coastline of any of the Islands, and lush tropical forests extending up to the mountain peaks. Known as the "Unconquered Island," Kauai was never defeated militarily by King Kamehameha when he united all of the Island under one rule. Kauai's spirited history also includes stories of the legendary small people known as Menehune, brilliant in construction and engineering while creating Kauai aqueducts and fishponds, and always completing the work in one night. You can see examples of their work at Alekoko, the Menehune Fishpond. When Captain James Cook became the first to establish Western contact with Hawaii in 1778 the first place he stepped onto land was Waimea on Kauai's southwest shore. Today a statue in Waimea town honors the British explorer. The missionary lifestyle and sugar plantations are also part of Kauai's past and glimpses of these eras can be seen along the self-guided Koloa Heritage Trail with14 stops over 10 miles. You can also see an original missionary dwelling at the restored Waioli Mission House built in 1836 in Hanalei.